Guru Maps is available in a ready-to-use state and app settings should be considered as an optional and more advanced way of using the App. 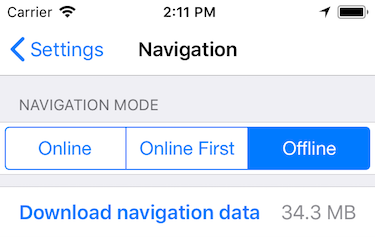 Settings let you configure app options, purchase additional features and manage routing geo data representation. Vector map source is set by default. Once you’ve downloaded the map (Internet connection required), it will be available offline. 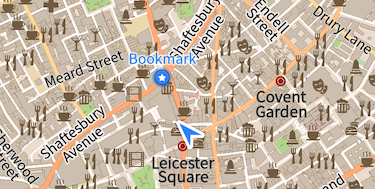 Vector maps are detailed, smooth, fast and provide high-quality image rendered in real time on the device. It takes up less storage space than raster maps. 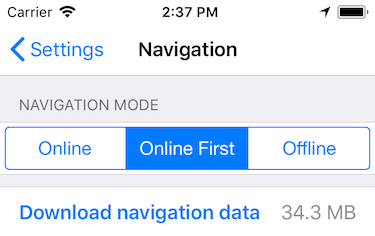 Read also: Online Maps Settings. You can also add any source of maps you like using a special XML file that contains formatted description from the map provider. In some regions, objects on the map in addition to local names have names in other languages. The map will show the names of the user designated the first language in this list if it has been defined by the user. 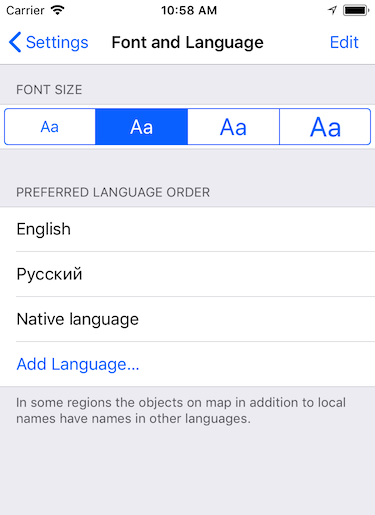 This feature may be useful for multilingual countries, such as Belgium where Dutch, French and German share official language status. 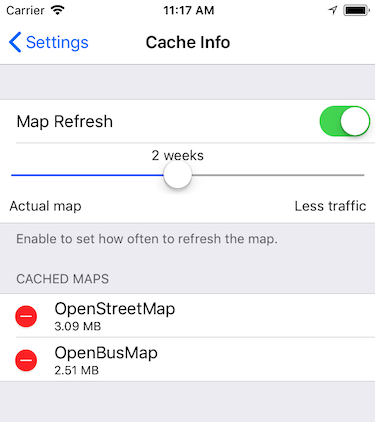 To set how often to refresh cached map tiles for online maps, go to Settings > Online Maps. All tiles older than selected time will be downloaded while browsing online. Note: The map refresh setting only applies to raster maps and not the vector maps. All loaded map tiles will be automatically saved to your device&apos;s storage and can be managed in Settings > Online Maps, so you can delete the tiles you no longer need if you want to free up storage space. 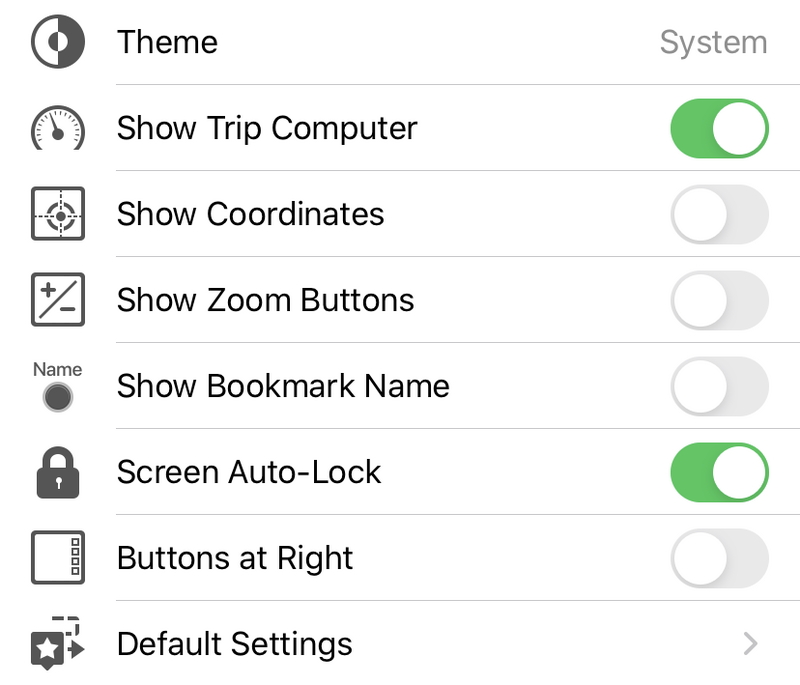 To hide trip computer panel from the map view, turn off this option. 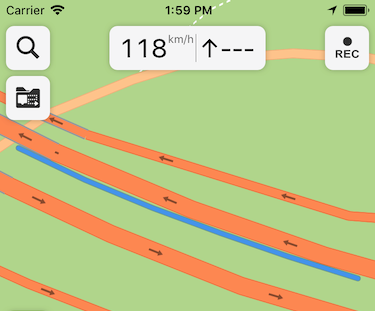 To make zoom control buttons display on the map, turn this option on. It will appear with plus and minus zoom buttons. The device screen will be turned off automatically after a specified period of time to save power. Turn this option off If you don’t want the screen to lock while using the Guru Maps. Turn this option on to display the major application functions. The functions will be aligned to the right of the screen for single finger selection. 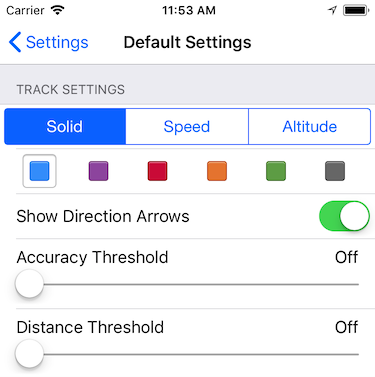 Selected style is a default line style for the newly recorded and imported GPS tracks (solid color/speed gradient/altitude gradient). To set the units system and coordinates format you would like to use within the Guru app, go to Settings > Units Format. Tip: If you connect your iOS device to the Bluetooth-capable stereo system in a car, you will hear voice instructions over your car speakers. 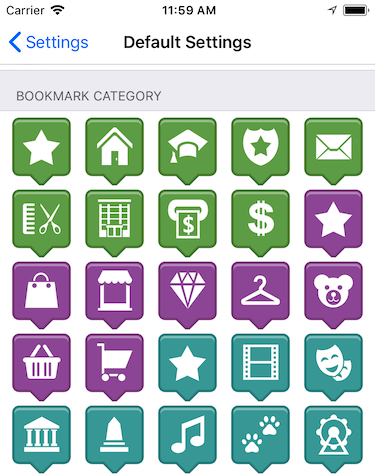 Guru app allows you to synchronize all your data to make your collections visible and available through all your iOS devices using your Facebook or iCloud account. 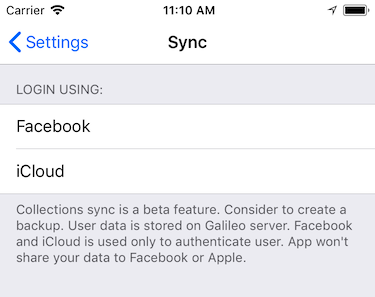 App uses Facebook/iCloud login only can be done, this does not let the Guru post or share your data. To enable the synchronization feature, go to the app Settings > Sync and select the desired synchronizing option. Use the same login on all your devices to keep the data synchronized. 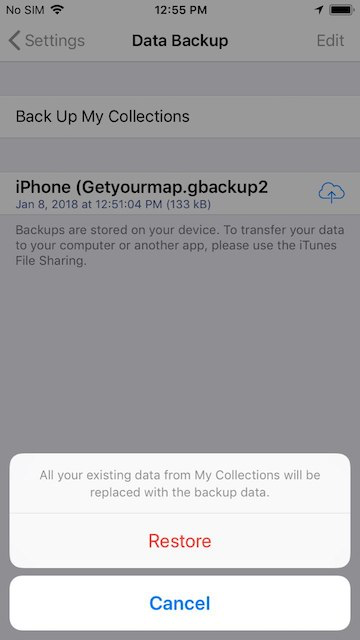 Backing up data is a great way to minimize accidental data loss and restore the most important geodata on your iOS device. Backups are stored on your device and will be removed automatically when the App is removed. To prevent data loss, we recommend that you backup regularly. The best way to keep your backups available across all your iOS devices is to use the Files App. Within the Files App you can set up your other cloud services as well (Box, Dropbox, OneDrive, Adobe Creative Cloud, Google Drive, etc). To save the backup, tap the icon, then select Save to Files option. Read also: Use the Files App on your iPhone, iPad, and iPod touch. 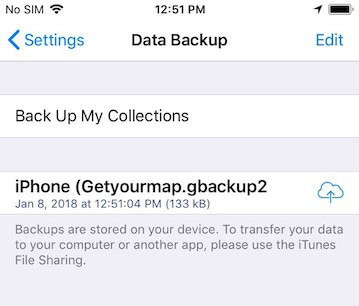 Tap the backup you created earlier in the list on the Data Backup screen to restore, or select .gbackup2 file from the Files app or from other cloud service (e.g. 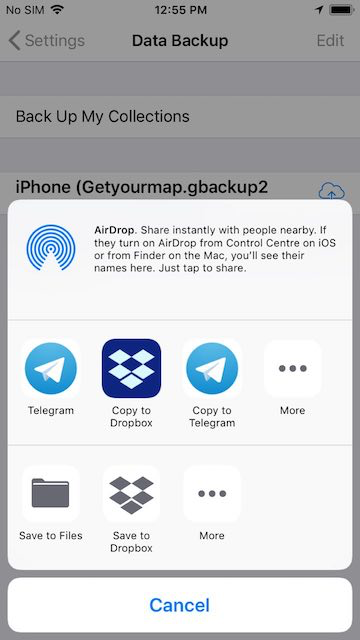 in Dropbox App), then tap the icon and select Copy to Guru Maps option.